Manchester Ceiling Tiles is rated 4.7 out of 5 by 22. 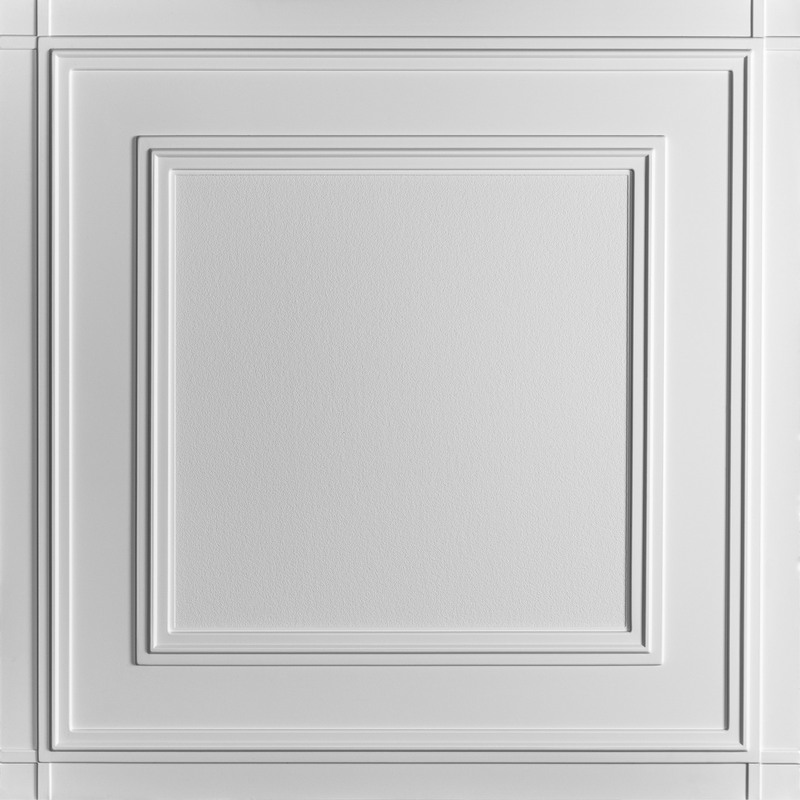 Manchester Ceiling Tiles combine classic styling with ingenious American engineering. Made from our Signature Series 0.030 in. thick vinyl plastic and designed exclusively for glue-up applications (ceilings and walls), Manchester's unique overlapping edge features make them simple to align and require no extra parts (strips or tape) to cover the seams. Warning: Do not install where temperature exceeds 140°F and keep heat sources 6 in. from tile surface. Please note that while the actual area of this tile is 3.96 sq. ft., the "practical coverage area" is 3.47 sq. ft. due to the way its edges overlap during installation. We'd be happy to send a sample. Please call us at 800-557-0654; we'll ask a few quick questions to make sure we get the right tiles for your kitchen project. We're here Monday - Friday from 7:00 am - 4:30 pm PST. Do I remove popcorn first? Yes, you must remove the popcorn ceiling finish prior to installing any glue-up ceiling tiles. That finish is too uneven to provide a level substrate for glue-up tiles; if you don't remove the popcorn finish first, your ceiling will have a wavy look. Can I install this as a bathtub surround? Great question! Ceilume's vinyl tiles will not be damaged by water. However, vinyl could trap moisture that gets behind the the tiles, leading to mold growth. If the tub has a shower, DO NOT use vinyl panels. In other situations, you can use your judgement. If, for example, you have an old-style bathtub that is free-standing from walls, we think Ceilume's tiles with overlap joints would complement the tub's appearance. Be sure to install the tiles from the bottom-up with the joints overlapping so any accidental splashes will drain without flowing behind the tiles. Rated 5 out of 5 by Tvela from Beautiful These ceiling tiles are gorgeous and added a touch of elegance to my room. I have them in bronze and it’s a beautiful color. Installing them was not too tricky if you know what you’re doing. Definitely worth the effort because the Ceilume Manchester tiles will make your ceiling look stunning. I’ve never wanted to stare at my ceiling so much as I do now. I definitely recommend these! Love them. 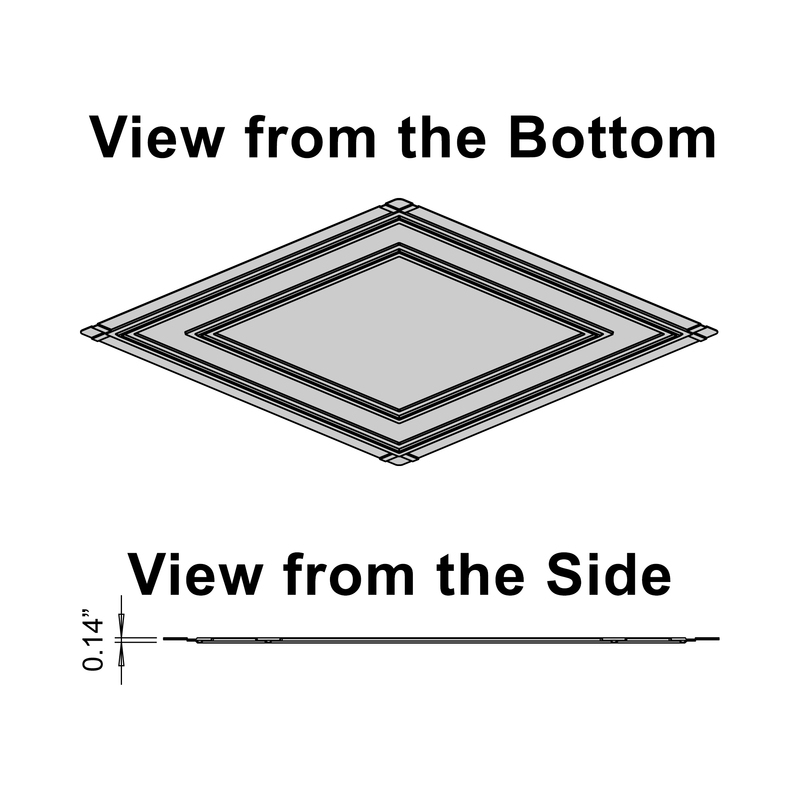 Rated 5 out of 5 by Mrsclay from Great Headboard As soon as I received these ceiling tiles we instantly knew we wanted to make them headboards for out beds. First we painted them our room colors then we turned them into headboards. One of my friends thought we bought the bed like that. The adhesive was very easy to use and was not messy at all. It was overall a very easy install and looks so good. Rated 4 out of 5 by Grrl54 from For Walls Too When I saw these tiles, I had a brainstorm of decorating ideas, but not for the ceiling. (The more ornate designs of these tiles especially in the metallic colors would be wonderful ceiling upgrades in a more traditional, classic decor.). The Manchester tiles in Sandal Wood were (to me) much more suited to wall than ceiling. The bathroom being redone has wainscoting, so I put the tiles above that line and created a beautiful and interesting wall. The secret is planning your placement and getting the area properly prepped and cleaned, as with any DIY project. The adhesive is included in the box with the tiles and is applied with a caulking gun. Once you get the feel of the amount of adhesive and the feel of pressing the tile in place, take the time to smooth all parts of the tile and the next one becomes easier and easier. I love that you don't have to paint (though you can as an option) and that in a day or less, you have a new wall. Terrific! Rated 5 out of 5 by Garner99 from Beautiful Ceiling Tiles I received my Ceilum Ceiling Tiles this week. They are really beautiful! We are having a hard time deciding where to put them, because we would like them in every room!!! Highly recommended for anyone who would like something different, than a standard painted, or spackled ceiling. Lots of amazing designs to choose from! Rated 5 out of 5 by SUEDB from Very nice I received Ceilume Ceiling Tiles - Manchester Ceiling Tiles to try and give my honest opinion. The tiles arrived in a strong box along with instructions and tile glue. They were easy enough to put up and you can paint them according to the instructions, which is a nice touch. Rated 4 out of 5 by ShelleyB from Great accent for a room! 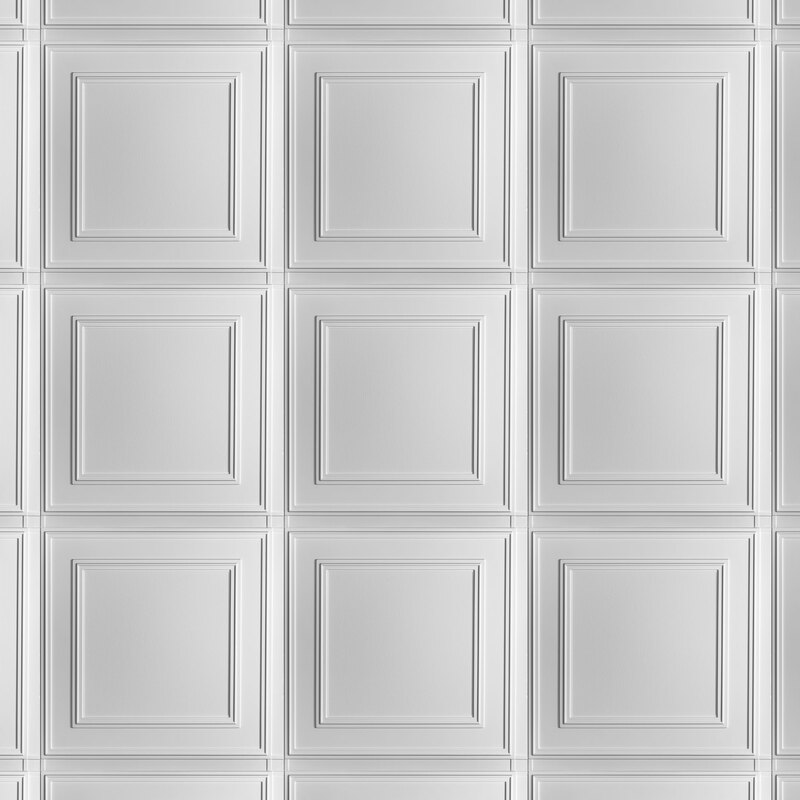 I wasn't sure what exactly to expect with the Ceilume Manchester Ceiling Tiles...how they would look in the room...would they be easy to install...turns out, they look GREAT and they are easy to do! They really helped transform the area to a classy living space for us! Rated 5 out of 5 by Emichalo1224 from Simple install These are so easy to install. I actually used them in two places. One in a bathroom where I glued them in and the other location was a den where we have a drop ceiling. Easy to follow instructions, adhesive cane with tile, and all went up quickly.